Here are my takeaways. 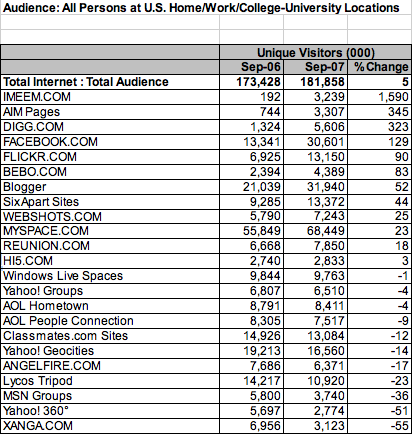 MySpace is still growing at a healthy 23 percent, despite its size. But Facebook is coming on fast, with 129 percent growth. Notice also the strong showing by Bebo (growing 83 percent) versus the lackluster U.S. growth of Hi5 (3 percent) and the decline of Xanga (negative 55 percent). In blogging platforms, Blogger is beating Six Apart on both absolute numbers (32 million visitors versus 13 million) and growth (55 percent versus 44 percent). In the doldrums territory, you’ve got Windows Live Spaces (with a one percent decline) and Yahoo Groups (four percent decline). And in the you-ought-to-seriously-think-of-shutting-this-down territory, there is Lycos Tripod (23 percent decline), MSN Groups (36 percent decline), and Yahoo 360 (’nuff said). 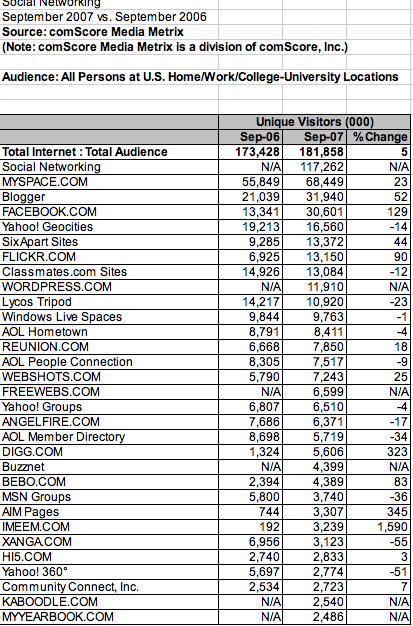 Here is a more comprehensive list of social sites ranked by total number of visitors. It includes sites where comScore could not calculate a growth rate because it did not have enough data for September, 2006. Some sites that stand out on this list, having come out of nowhere in the past year, include WordPress.com (with 11.9 million monthly visitors), Freewebs (with 6.6 million), BuzzNet (with 4.4 million),and Kaboodle (with 2.5 million). (Update: Also, you will notice that Google’s social networking site Orkut isn’t even on the list. That is because while it had 24.6 million visitors worldwide in September, 2007, Orkut only attracted 503,000 visitors in the U.S.).